Roman legionaries utilized shield-wall formations in battle. Shields like this Roman Legion Scutum allowed them to create almost impenetrable barriers. These shields evolved from circular shapes in order to offer more protection. It curves gently around the holder and allowed zero space for anything to get past when interlocked with others. A polished steel boss is mounted in the center to help deflect blows from enemies. 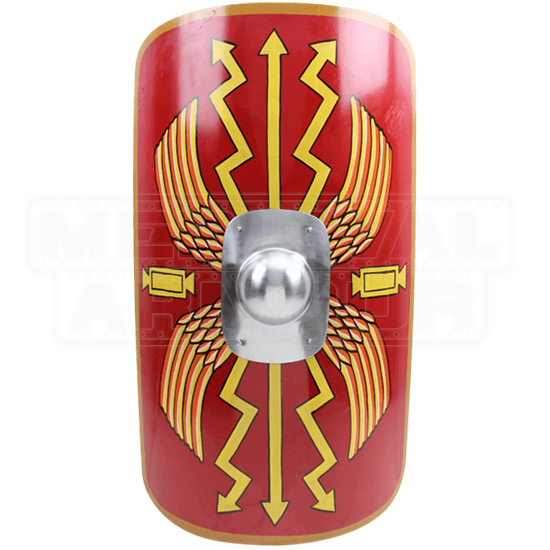 This shield features a red face with gold trim. The design in the center displays yellow wings and arrows extending outward. This steel shield makes a fantastic display piece and is the perfect way to complete the look of an ancient legionary.